Dodgers Miracle Matchup by IBM? As a lover of Dodgers' oddball stuff I had to find out more. Unfortunately, information is a bit lacking. From what I can gather, IBM put together a group of simulations for various teams and debut the results during an upcoming game in 1986. In the Dodgers case it was unveiled during a game between the Dodgers and Reds in early September. I am uncertain if this was an in-game promotion or a commercials fans could watch on television. If you happen to know anything about this please pass that knowledge along. Spring training in New York. During WWII it was thought unwise to hold spring camp anywhere near the eastern coast. After all, German U-boats where known to hug the American coastline in an attempt at disrupting supply lines to the European front. So, the Dodgers spent several March's in Bear Mountain, NY. DODGERS PITCHING STAFF. Bear Mountains, N.Y.....Photographed at the Dodgers spring training camp at Bear Mountains, is team's pitching staff. 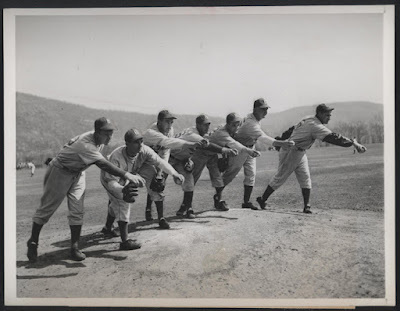 (l. to r.) Joe Belmaier, Vic Lombardi (only southpaw in the camp of pitchers), Hal Gregg, Curt Davis, Fred Wells, Otho Nitcholos, and Ben Chapman. This Day in Dodger History: In 1957 the Dodgers, Walter O'Malley, purchased a 44-passenger twin engine airplane for $775,000. They would be the first team to own their own plane. In 1977 the Dodgers received catcher Johnny Oats from the Phillies in exchange for infielder Ted Sizemore. In 2001 the Dodgers signed free agent reliever Giovanni Carrara. In 2006 the Dodgers received Tim Hamulack and Jae Weong Seo from the Mets in exchange for Duaner Sanchez and Steve Schmoll. Happy Birthday, Tommy Corcoran, Bart Shirley, Charlie Manuel & Ted Lilly!